Harry N. Abrams, 9781419712210, 232pp. Neil Swaab is an NYC-based illustrator whose work has appeared in the New York Times, the Utne Reader, the Village Voice, and most recently, James Patterson’s Middle School: My Brother Is a Big, Fat Liar. Swaab has also illustrated posters for Broadway shows and worked on Adult Swim’s Superjail!, Comedy Central’s Ugly Americans, and Cartoon Network’s Annoying Orange. Learn more about Swaab at neilswaab.com. "Max's proposed campaign and Swaab's oblique storytelling style are equally engaging." "...sure to hit the mark with middle schoolers in the trenches." 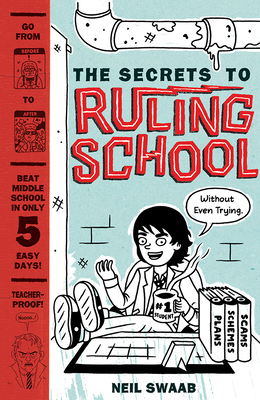 "Swaab pulls off the tone of a seventh-grader: snarky, antiauthoritarian, and preoccupied with both the social pecking order and bathroom humor. There is not one bit of advice Max gives that adults would concur with—and therefore, kids ought to love it."